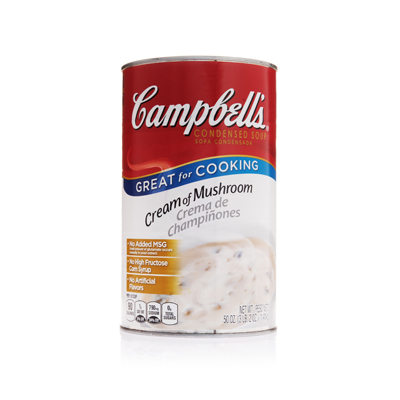 Campbell's® Condensed Cream of Mushroom Soup and Pepperidge Farm® Herb Seasoned Stuffing combine with chicken to make a tasty Chicken and Stuffing bake that everyone will love. 1. 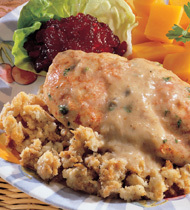 In each of 2 baking pans (12x20x4) mix 1-1/2 quarts water, 1-1/4 cups margarine and 1-1/4 gallons stuffing. Made with specially baked "stuffing bread, " and dusted with just the right touch of herbs and spices. It is the ideal complement to your entrées. 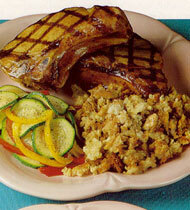 skinless, boneless chicken breast halves, 4 ounce each	 40 ea. 2. Place chicken on stuffing mixture. Sprinkle with paprika. 3. Mix soup, milk and parsley. Pour half over each pan. 4. Bake at 400º F. CCP: Heat until internal temperature is 165º F. or higher for 15 seconds and chicken is no longer pink, about 1-1/2 hours. 5. CCP: Hold at 140º F. or higher. Portion stuffing using No. 6 scoop (3/4 cup). Serve with 1 chicken breast half. skinless, boneless chicken breast halves	 40 ea.